This cake was made by Dream Cakes in California for Girl vs Food. 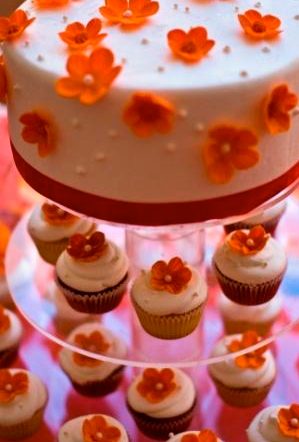 I love the idea of having a cake to cut into and cupcakes for the guests to eat. Not everyone like cake so if there are cupcakes I think it's easier for people to pass on the 'cake' or just have a bit and maybe eat more of the other yummy dessert options. 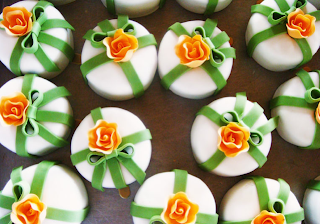 I found these mini cakes on Adventures in Wedding Planning by MasterPiece Weddings, unfortunately it was part of a style board so I don't know who made them, but I like the idea of guests having their own mini cake to take home from the reception. I would like the flowers to look more like the ones on the wedding cake but I'd leave the green bow detail because it makes the cakes seem even more like a gift.